While many readers knew that last night was the reception for the Best of 604 awards, most were not aware that there was also another party being held at a swank restaurant on Granville Island. Sarah and I were invited to attend both and it created some interesting and funny situations. The party at Granville Island was put on by the Industrial Alliance, a life and health insurance company that offers a wide range of life and health insurance products, savings and retirement plans, RRSPs, mutual and segregated funds, securities, auto and home insurance, mortgage loans and a bunch of other stuff. Like most financial firms, Industrial Alliance has no idea there’s a recession going on. Their party was held at the beautiful ocean front Dockside Restaurant on Granville Island, which offered a stunning view of False Creek and Vancouver at night. There were huge spreads of food, chefs doing live cooking, dessert tables and an open bar that served every drink known to man. By comparison, the Best of 604 reception was held at the Cellar, which had no view at all because it’s a cellar. I did found out later that they had some finger food and one free beer per attendee. We decided to hit the Industrial Alliance party first, fill up on food and drinks, and then head across the bridge to accept my award for Best Personal Blog of Vancouver. For those who are on the fence about Twitter, the following tweets may help to shed some light on its true powers. All who were following me on Twitter would have know what happen last night instead of waiting until now to find out. And most importantly, you were able to participate in the event. You want to build a relationship with you readers? Twitter is a great way to do it! @JohnChowDotCom You can do it! Wondering if I should head over to #bestof604 They don’t have free food or open bar like this party. @JohnChowDotCom just chug a few and you’ll be fine! @JohnChowDotCom don’t you hate that. If you invite someone to a party then bring on the food and booze. @JohnChowDotCom hope you come, wanted to tip a pint with you. I’m good for a couple drinks gratis! Everyone at this party is wearing suits and I’m wearing a Market Leverage T-shirt. He. He. He. @JohnChowDotCom hahaha All the luck johnn…. btw, where could i get one of those tshirts? @JohnChowDotCom LOVE IT!!! Show that shirt off (and send us some pics)! @JohnChowDotCom I love the MarketLeverage T-shirt. It’s so comfortable. @NetChick i’m at Dockside restauarnt in Granvile Island. It’s a party for financial planners. They don’t know there is a recession it seems. @JohnChowDotCom they are expecting a bail out. I ate like 10 plates of this. @JohnChowDotCom 1 gallstone… 2 gallstone… TEN Gallstones! 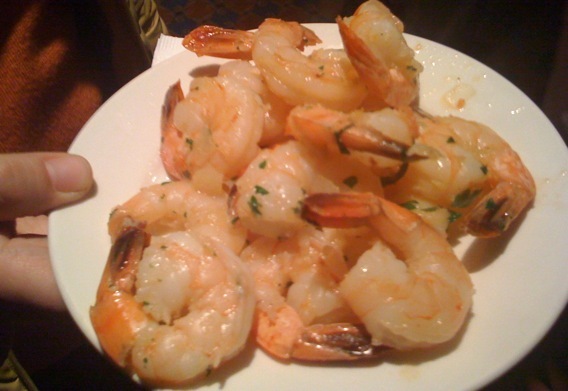 @JohnChowDotCom That look sooo good, now I really want some shrimp. @JohnChowDotCom OH that looks so good!! I am now starving……. @JohnChowDotCom I agree with Stephen…are you even watching your health? @JohnChowDotCom And you didn’t save me any? I’m stuffed. Heading over to #bestof604 to get my award. I had no doubt that I would win the Best Personal Blog of Vancouver. Given the size of my readership vs. the competition, it wasn’t even close. My goal wasn’t to win the award itself. My goal was to get more votes than the entire field combined. I came up short, with 46% of all the votes. Gus Greeper was runner up with 7% of the votes. You can see the full list of award winner at Miss604.com.